Apple has brought the multi-touch gestures available to MacBook users to the desktop with its new $69 Magic Trackpad, as well as a new battery charger for wireless devices like the Magic Trackpad, Apple keyboard, and Magic Mouse. 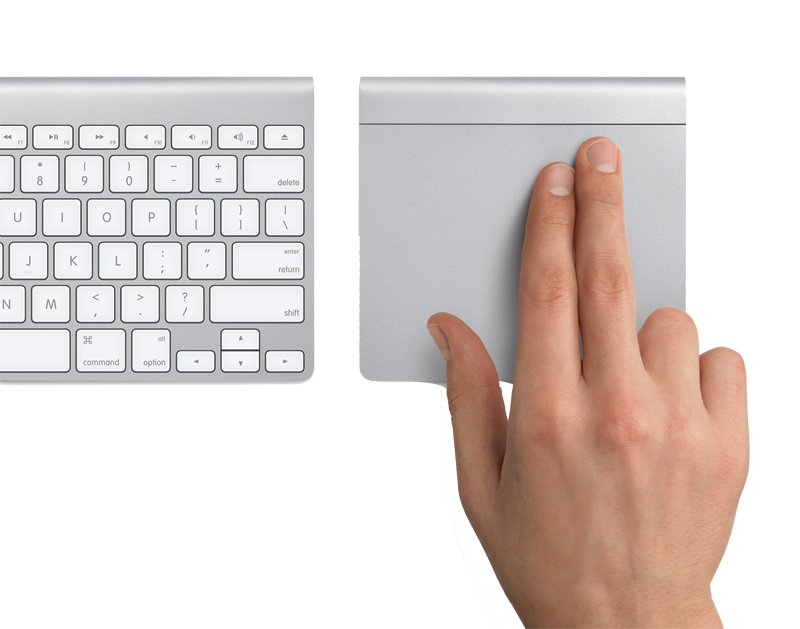 The Magic Trackpad offers Apple's patented multi-touch technology through a smooth glass and aluminum design. It enables users to scroll smoothly up and down a page with inertial scrolling, pinch to zoom in and out, rotate an image with fingertips and swipe three fingers to flip through a collection of Web pages or photos. Photos of Apple's Magic Trackpad first leaked earlier this summer, showing the multitouch desktop accessory before it was even announced. Earlier this month, the device received FCC approval, though at the time it was simply identified as a mysterious Bluetooth device. Apple first brought multi-touch functionality to its desktops last year with the Magic Mouse, a Bluetooth wireless mouse that allows users to use their fingers to scroll and zoom via the surface of the hardware. Every iMac and Mac Pro comes with the Magic Mouse, though users can now order the new Magic Trackpad for $69 as an option. Apple claims its new Battery Charger sets a new industry standard by having the lowest standby power usage value  or "vampire draw"  of any similar charger on the market. That's the energy most chargers continue to draw after their batteries are fully charged. Instead, the Apple Battery Charger senses when its batteries are done charging and automatically reduces the amount of power it needs. In addition, the reusable batteries that come with each Apple Battery Charger are designed to maintain a high charge capacity for hundreds of charges, so you no longer have to buy new batteries or toss them every few months. Each Apple Battery Charger comes with six AA NiMH batteries, intended to allow users to run their keyboard keyboard and mouse or trackpad, while allowing two more for spare charging. "Unlike many other reusable batteries, these batteries have an incredibly long service life  up to 10 years," Apple said. "Which means you can finally break the cycle of buying and disposing of those toxic, single-use alkaline batteries. The batteries that come with the Apple Battery Charger kit also have an extraordinarily low self-discharge rate. Even after a year of sitting in a drawer, they still retain 80 percent of their original charge. That way you always have backup power when you need it."